It's very simple to use this game designed by the folks at The Philosopher's Magazine. A few years back they did an issue devoted to children and philosophy. The issue has a game a teacher can organize with their students called the World's Most Valuable Thing. I provided a scanned image of the handout above you can use, or if you are feeling creative you can use your own handout with your own world's most valuable things. 1. Ask students to write in their journals about "What is something I care about more than anything else?" If students have trouble pinpointing one thing encourage them to use prewriting strategies, listing, brainstorming, word clouds, etc..
2. After students have written for about five-ten minutes have some students share their writing. 3. Tell students that we as a class have been assigned to determine an answer to the question, "what's the most valuable thing?" Today, in class, it is time to figure out what exactly is most valuable. 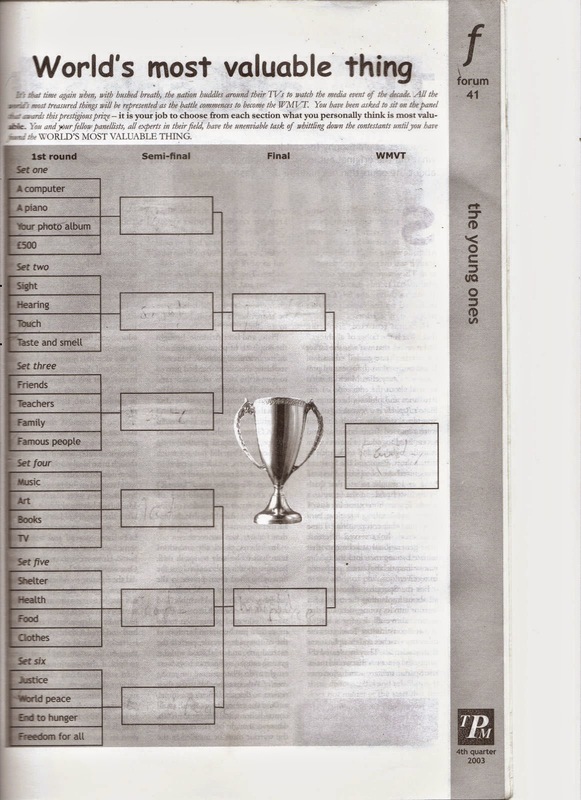 Explain to students that there will be a tournament to decide what is the most valuable thing. Here, you can be as creative, or silly, as you can allow yourself. Have a banner that reads, "World's Most Valuable Thing Tournament". I always say the cornier the better! 4. Divide students up into groups of four. Distribute one handout for each group. 5. 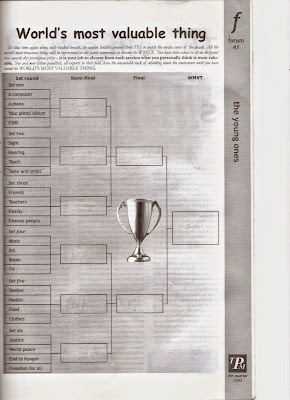 The tournament is divided into first round, semi-finals, finals, and winner. 6. Explain to students that for each group, it is important to discuss each item and try to figure out why one is more valuable than the other. 7. Students should only vote for a valuable thing in a group until there is a general consensus in the group that the thing is more valuable. If someone disagrees it is the group's job to come up with convincing reasons why something is more valuable than another. 8. The teacher should circulate around the room and add to the discussion and make sure students are actively engaged and not simply blindly writing down winners. 9. Once students determine a winner, the group should write together a summary of the event and why they chose their most valuable thing. 10. When the students have finished have everyone return to their desks. Invite students to share their experiences and ask the following questions. What things were the most difficult to determine as valuable? Which things were easier? Are physical things easier to give value than non-physical things? How does our society value things? Do you think society should be taught how to value things? Why is value different than worth? Does what you value tell you something about a person? Or a society? Can what a person values be connected to their beliefs? Their religion? Extension: students can create a poster or handout illustrating their most valuable thing. Or students can write an essay explaining how this game could be effective in groups outside of school.